Darin was diagnosed in June 2002 with an astrotytoma in the optic-hypothalamic region; it is often referred to as an optic giloma. Darin has a variant called a pilomyxoid astrotytoma and although this is still a low grade brain tumour, this can behave aggressively. Darin started his first chemo shortly after his diagnosis, it lasted a year. He then had a break of a year before restarting with the same chemo (careoplatin vincristing) due to tumour growth. During the second lot of chemo Darin experienced some hearing loss. After a six month break Darin became symptomatic, a scan revealed new tumour growth and a cyst that needed draining. After an operation to drain the cyst, Darin started his latest chemo. As of September, Darin is six months into an eighteen month course of a weekly chemo called vinboastine. For Darin all this chemo will not cure him, just buying him time in the hope that at some point in the future the tumour will burn itself out. Darin has had many operations, from tumour biopsy and shunt placement, to shunt revisions and port placement (a type of central line). Darin has had five different ports; his latest was placed in august 2006. Darin is visually impaired, he lost all his sight shortly after his diagnosis but in the next two years some gradually returned, his sight is now quite stable, enough that he has started to read and write. Darin is an obsessive compulsive; he talks about the post and postman all the time and for him to receive his own mail would make his day! Darin finished chemotherapy but started suffering from more headaches and sleepyness, he was having the cyst/tumour drained weekly but it wasn’t helping for long, so in March 2007 he has started a 18 month course of chemotherapy again. Darin is now moving on from Post Pals, but I want everyone to know that Post Pals has been a wonderful addition to our life, the support that so many wonderful people have given us over the years has been amazing, through both good times and bad. Thank you. I’m sorry we don’t update too much anymore, Darin’s tumour seems to be holding steady which is great. Unfortunately I am now struggling with Darin’s behaviour, it hasn’t really ever gotten better since he was a toddler, but what was acceptable then really isn’t now. He is very needy and egocentric and can sometimes be quite aggressive. Most of the time he is a lovely child but he can change quickly if his routine changes. We are waiting for an appointment to see a clinical psychologist, in the hope that he can get some help. Darin is away at over the wall camp this week in the Midlands. I’m missing him loads and it is strange not having Darin constantly following me around, but Emily and I are getting to spend quality time together, something that rarely happens when Darin is home. Darin is doing well and we have had great news in that his tumour has shrunk a little – only the second time since his diagnosis! Wow Christmas is over already and we are into another new year! Darin had a pretty good month for the most part, his thyroid medicine is working well and his energy levels are so much better, which is great news. Christmas was really special for all of us, I think it was the best since Darin was born. He got some really lovely gifts, including a pet dinosaur (called a pleo), which he loves as he can interact with it with out the use of remotes or any other type of control (which he finds very difficult to use). Thank you so much to everyone that sent Darin a card, he loved having all the cards read to him. To our reindeer, Darin loved all the letters and he and Emily enjoyed all of Blitzen’s activities that were sent. To Post Pals for the goodies that were sent. Thank you to our two elves, who were Alan Barrett and a secret one, for all the gifts you sent, Darin loved opening every one of the pressies. Thanks to Karen, Molly, and Ruby, for the gifts you sent, Darin loves the car track and funny penguin and Emily always loves smellies. Thanks Nicola for the gift voucher, you read Emily’s mind, it was spent by the 27th on a bag she had had her eye on for quite a while! Thanks also for the box of goodies, Emily found it so useful. Darin also loved the pillowcase with the pressies inside, what a lovely idea, I have a feeling it will be used again. Thanks to C Cannon (hope that’s right) for the painting by numbers. I know I have missed at least one person as we also got an elephant mask and some stickers, but I seem to have misplaced who they were from, so I’m really sorry if I have missed you. Darin has really enjoyed every thing that you all have sent this year, thank you for all the support you have given us over the last few years, the cards and gifts have given Darin such a boost when he has been feeling low. Well once again it has been a month of ups and downs. Darin is doing well at school but I was concerned about how tired he was getting, even though friends around me were telling me their kids were tired and it was just the time of year. I was still worried, so last week I called the endocrinologist (she deals with all the hormone stuff) and she rechecked Darin’s last blood results. It showed Darin was at the low end of normal for his thyroid so it was decided he should start on thyroxine. It’s just a small pill once a day, but it’s yet another medicine for him to take (and for me to remember!). Darin had a lovely birthday. Thank you to Karen, Molly and Ruby and Post Pals for the pressies and to every one that sent him a card. He really enjoyed opening them all and having me read them all out to him. We want to wish you all a very merry Christmas and hope for all our friends and fellow Pals that it’s an uneventful one (unless it is a good event). Darin has had a great month. People we have not seen for a long time keep coming up to me and saying how well he looks compared to last year and I have seen it too. He is willing to try new things, stuff that I thought he would never do. Last week we went down to Cornwall for the weekend and visited the Eden project, they had erected their ice rink already and I suggested we should all have a go. Darin was keen, but I was sceptical, I didn’t think he would last a minute after he got on the ice. Well he proved me wrong; he stayed on the ice for the whole 40 minute session and didn’t fall over at all. It is really great to see Darin like this, so much of his life has revolved around the hospital, finally he is able to be a normal little boy. He does still get very tired so we do try not to do too much too quickly though. I just hope this lasts a long time! Darin is counting down the days until his birthday. This year he is going to have a party with some of his friends and he is going to take them bowling as Darin wanted to do it last year but I didn’t think he was really well enough. Thank you to everyone that sent Darin a postcard (Mandy, Michelle and family, Sarah and Gerry and Hannah) Julie Barrett and Post Pals for the pressie, which I think is an early birthday pressie so hasn’t been opened yet. Darin has had a good month in general, although he is still getting headaches and is now saying they make him feel dizzy. Darin had his 3 monthly MRI and the cysts etc. are looking better. The tumour is pretty much the same and so there really isn’t an explanation as to why he is getting them. Darin had an eye appointment too which went quite well. We don’t usually see the same doctor and every time we have been before the doctor has never really seen past his eyes to the child, but this time the doctor really seemed interested in how Darin’s eyes affect everything he does and she promised to make an appointment to get him evaluated for low vision aids (although I’m told glasses won’t help him there are some other things that might like magnifiers). I was pleasantly surprised when we got an appointment through just a week later for the end of this month. We had a great holiday in Wales – it was raining most of the week but we managed to have a lovely relaxing break and Darin got to see and do lots of new things like candle making. Darin is back at school already and because of the rain we didn’t get out as much as we would have liked during the holiday, so I think Darin was pleased to go back and see all his friends. Thank you to every one that sent Darin a card this month, he really enjoys having them read to him. Darin has had a pretty good month this month. He is still a bit tired and headachy; it seems to be a common thing nowadays. The headaches are only in the morning now, so I think it’s just that the shunt is not draining correctly whilst Darin is laying down. It has been suggested I try one of those support pillows that are V shaped to try and stop him laying flat at night. We are going on holiday on Saturday to a caravan in Clarach bay Wales. We are hoping the weather is nice!! Please would you all spare a thought for Paula, Rob and Joe, as Jack Bradley B is being buried today. We had got to know the family so well over the last few years and we are all devastated that Jack lost his battle after fighting so hard for so long. Thank you to Viks for the Post Pals party, it was so nice to meet some of the other families as well as Kate D and Karen (Sami). Thank you to Percy the dog (and Jane for writing the letter). Also to Susan, Mandy, Lindsay and Karen, Molly and Ruby for the post cards. Thanks to Linda B, Maddie, Kerry and Amy, Helen, Michelle, Tim and Jonathan (X2) and Erin F’s Nanny and Granddad (also X2) for the cards. To Post pals for the Kung Fu Panda card mask and colouring picture. To June Junko for the card with the elephant and cats mini posters. Julie Barrett for the card and cardboard make your own elephant. Nicky for the card and colouring book and Grace and Chris for the card and sticker book. I seem to have a few other bits and pieces that I’m not sure where came from so if you sent any thing else, thank you. What a month! As usual Darin is keeping me on my toes. He had been doing quite well until Sunday. We took him to his swimming lesson and he flatly refused to even get changed to go in the pool. I was pretty cross and took him home. We were supposed to visit family as there was a birthday that afternoon, so I told Darin because he was so naughty he would have to stay home with Emily. So off I went. Well I got there and sat down and as soon as I did I got a call from Emily saying Darin had been sick. James, my boyfriend, said he thought Darin had just wound himself up which is not like him at all so we came home. Darin said he was fine and had a lay down but 5 minutes later he was sick again. I was concerned enough to call the hospital and they said someone would call back. About 10 minutes later Darin was sick again and by now I decided something had to be wrong and we headed off to the hospital. Darin continued to vomit (10 times in total poor thing) so it was decided to keep him in and do a scan. It showed what looked like a shunt failure. On Monday and Tuesday morning Darin seemed to be better so he was scanned again and put on the surgery list just in case. By mid morning on Tuesday Darin was really sleepy and the scan was the same so they took him down and put in a new shunt and a device to drain one of the cysts that is becoming problematic as need be. The operation lasted about two hours but in true Darin style (stubbornness more like) he decided he didn’t want to wake up after the operation so was in recovery for quite a while. The operation was successful and it was felt Darin was well enough to come home yesterday and hopefully back to school Monday. Darin is not allowed to wash his hair for two weeks, which is not good as his head is covered in betadine or something like that and is really yucky and there will be no swimming for at least a month. I felt so guilty for being cross with him. He has had a shunt for 6 years and never gone down hill that fast before, so I will need to be a bit more in tune with how he is feeling in future! As usual I want to say thank you to every one at Post Pals and all of you that write, email or just think of Darin. Thank you to Hayley Thorn, Tracy, Gerry and Emily, Post Pals, Karen (Sami), Sophie P, Kerry and Amy, Tor, Dawn, Kate W, Shelia S, Mandy, Despina, Hannah and Gerry and Lindsay and Navaz for the cards, letters and postcards. To Tracy and family for the postman Pat sticker set, Sophie P for the stickers and pegboard, Post Pals for the elephant wrist band and cow and really big thank you to Munira Hamdan for adopting the pygmy elephant from the WWF in Darin’s name – he really loves the stuffed elephant and has named him Squirty. Darin is due a scan on Thursday. I don’t normally get on edge but Darin has started to get headaches and is very tired again so I just hope it is nothing and not a new cyst or the old one rearing its ugly head. I just wanted to say a huge thank you to everyone involved with Post Pals. Darin has had so many wonderful messages of support and they have really helped during some tough times. Thank you to Julie Barrett, Viks, Mandy, Alison, Linda B, Helen F and pal Erin F’s Nanny and Granddad for the cards and post cards. Also to Sheila for the letter, postcard and key ring and to Karen, Molly and Ruby for the cards, I hope Ruby is feeling better now. Darin is doing well, although he is still getting some headaches. Last week Darin started to learn the guitar. He had been asking to learn for at least a year, but was told he was too young until now. He seems to have really enjoyed his first lesson. Thanks to all that have sent Darin posty these last couple of months, he has really enjoyed every thing that has been sent. Also, thank you to Jade Boyd – Emily loved the lamp. Darin has had a pretty stable month. His headaches had lessened (as for a while they were mostly only in mornings as a result from lying flat all night, with the occasional one during the day) but unfortunately they do seem to be increasing again. I have not heard from the neurosurgeon as to what he wants to do yet – you may have noticed from past posts that we often play this waiting game. I don’t mind at the moment as Darin is too well for me to feel comfortable with him going in for another major surgery. I have also decided that after missing out on the only holiday we had booked last year that we are going to have a really special one this year. So with the help of the Christian Lewis Trust we are going to Disneyland Paris for a few days next week. I have also been approached by Make A Wish who asked if they could use Darin’s photo for some of their fundraising. I think he is going to be on the next dairy crest envelope collection as well as the MAW home money boxes. I want to say thank you to every one that has sent Darin post this month. Unfortunately I am not too sure who sent what (my mum helped Darin open most of his post this month so it was everywhere – they both got a little carried away but had so much fun!) I do know that Karen, Molly and Ruby sent Darin a keyring with an elephant on it as well as a picture and a huge thank you to Leonie for the craft drawers and all the cards from your art trading card group. Also to Kate for the poem, I think I will frame it and put it next to the photo collage that Vikki sent. Thank you to Judi, Lindsay, Nicky, Eety and family, Michelle, Erin F’s Nanny and Granddad, Wayne, Helen, Julie and family, Linda, Kathryn, Cathe, Marylin and Damian, Colette, Sophie, Ann, Jenn, Hanna, St Matthews Sunday School, Mrs Skinner, Linsay and Navaz, An and Daphne. I really can not say thank you enough for all the support every one of you has given Darin, it has often given him something to smile about when he was feeling pretty low. Well I’m not really sure where to start this update. If you have been reading Darin’s caringbridge site then you will know he has been having headaches and neck pains. Darin had a scan yesterday, which I will add he was so good for. My son is like a jumping bean, he just can’t keep still, yet he managed to lie still for more than 45 minutes yesterday. I was able to find the oncologist and we sat down and looked at the scans together (we used to have to wait for a radiologist to read them first, but now it’s all put straight on the computer and can be looked at immediately). We could both see that there was an area where the tumour has grown and that there is a bit of cystic activity. I have heard that sometimes the tumour can get a bit angry after the radiation just before it dies; however, the oncologist doesn’t think that is the case and wants Darin back on chemo soon. We have to wait until next Thursday when there will be a tumour board meeting to see what the recommendations will be. The scans will also need to be looked at by the neurosurgeons to see if something can be done about the cyst – they may go in and drain it or try and debulk it again! I keep comparing how Darin was a year ago to now and there is none, this time last year he was sleeping most of the day away, I had a hard time getting him up to do anything, now he is full of life again. It gives me hope that this is just a temporary blip. Thank you to Julie Wolverton, Erica, Kate Dee, Carol and David Bleasdale and Sophie P for your cards this month. Karen thank you for your email, sorry I didn’t email you back I will try to soon and I hope you are doing Ok! December just flew by for us. In general Darin is doing well, he is managing school although towards the end of term he was a bit tired. However he is complaining of some leg pain, we are seeing our consultant this month and will bring it up with him. Christmas was wonderful; we spent the day at home playing with so many new toys. Boxing Day I had my mum and sister and her two kids over. It was hectic but a lot of fun. Last week I thought Darin was having more trouble hearing so I called the audiologist, hoping to get an appointment within a week or two, but luckily they had an open slot that day. It turns out there seems to be a large build up of wax that is blocking the sound (this sometimes happens after radiation in the areas Darin had his) we were sent home with drops and an appointment for mid January to have his ears syringed. Thank you to every one that sent Christmas cards, we had 33 in total, so I hope you don’t mind if this is a collective thank you to everyone and not done individually. Thank you to Kelly and Emma for your letters and to Becki, Karen (Sami), Julie Barrett, Vikki’s Granddad for your gifts and to Karen Moore and family for the gifts for both Darin and Emily (Darin loved the stickers and Emily loves doing her nails), also to the person that sent Darin the stocking with his name on it, sorry we lost the label so I can’t remember who it was from. To our Elves this year, Allan Barrett and Paul and William another thank you, all the gifts were wonderful and much appreciated. On the whole, Darin is well. We celebrated his birthday by going bowling and then eating pizza and we all had a lovely time. I do find it hard sometimes finding things both kids enjoy, not just because there is such a big age gap between them, but also because Darin finds most normal things difficult to do! I think bowling is a great compromise (once Darin got over the noisy atmosphere) as it is so adaptable. Every one is really looking forward to Christmas this year and seeing out what started as such a bad year, but turned in to one of the best since Darin’s diagnosis. This month has once again been full of ups and downs! On the up, Darin finally got his wish. It was a really lovely day and was picked up by the local newspaper (http://www.thisisbristol.co.uk/new/util/content.jsp?id=18695343 this was issued from an earlier press release and we didn’t manage to do it all, but I love the picture) as well as both BBC and ITV local news. It was also filmed by MAW and may be used to promote the charity (I got the video yesterday, I think it was so well put together). I will try and put it up on the internet along with some of the pictures. We have also been approached by cancer research as Darin got a little star last year and also that’s life magazine. I am not a great fundraiser but really feel if I can get people to understand how even so called benign (I hate that word) brain tumours are devastating then I feel I am doing my bit to help. On the down side, Darin is still getting headaches and feeling sick. I took him in last week and they did a CT scan but every thing looked ok, this week he does seem a bit better though. Darin had an MRI on tuesday, it is his first since the radiation and this will be used as the base line from now on (he will be scanned every three months again now) from here we are hoping for stability or shrinkage of the tumour, any thing but growth! Next week we are going down to the West of England school, where Darin will get a full evaluation of his vision. It’s a two day assessment so should be very informative. The week after is Darin’s birthday, he wanted a party for his friends, but I was too late, so instead we will just make it a family thing. He has decided he would like to go bowling then maybe pizza hut. Can you believe we are just 8 weeks from Christmas! I keep looking back on this time last year, I’m so glad that it’s behind us now, Darin is doing so well compared to then, it has been a tough year for all of us! Thank you to Karen for your letter, as usual Darin loves hearing about you, Molly and Ruby. To Julie Barrett for the book (which Darin loves) and Deb and Derek, I read the story of Sadako and her 1000 cranes a few years ago. I tried to fold a crane myself but couldn’t, one day I will get the hang of it and will fold 1000 cranes (well I just need 999 now), then I will visit her memorial, maybe I will get my wish, that one day Darin will be cured! Sorry if I missed any one out, my mum said that there is some more mail at her house but we have not been able to pop round and get it yet. Darin had a quiet start to the month, only a couple of appointments. He is quite tired, maybe down to the radiation or being back at school full time or perhaps a mixture of both. Darin had his port out last week along with 3 teeth, 2 were loose and the other he had managed to ground down right to the gum. Unfortunately, some of the port had got stuck and the surgeon couldn’t get it all out, but I’m told it really shouldn’t cause too much of a problem though. I had to meet with the school this week regarding Darin’s literacy, they are really concerned that Darin is struggling with print reading. The school purchased a CCTV magnifier but it has to be enlarged so much that all the detail on the page is lost. They feel that Darin should be learning Braille again, which I completely support. We thought he would need Braille when he was a toddler, but the last two years he proved us all wrong by reading. Unfortunately, the debulking this year must have done some extra damage, it may settle and he may be able to read large print again, but it is best to start Braille skills early as it is very hard to pick up as you get older. He will still be using print to write though as he is too weak to use a Brailler. He now has his own laptop at school and is learning touch typing using speech software. I think we finally have a date from Make A Wish as long as there are no more delays it will be October 16th. The post office are even going to supply him with his own uniform! I haven’t told him that it’s defiantly happening; I think I will keep it a surprise. Thank you to post pals, Julie Barrett, Sophie P, and Sonia for the post cards, cards, letters and gifts. Julie, Paradise Park looks lovely, I will have to take Darin there one day. To Karen, George, Molly and Ruby, thank you again for your lovely cards, letters, pictures and gifts. Darin has had lots of fun colouring in postman Pat. The weather was great and the park wasn’t too busy. In the morning we went fishing for ducks, searched for some treasure and did some digging using static diggers. We then drove some dumper trucks which Darin really enjoyed. After lunch we met up with Barry who took Darin out to a special area where he got to drive a full size JCB. He had great fun steering the JCB around on the mud and even got to shovel up, lift, and dump big loads of mud all over the place. After, he was very lucky and was given some lovely souvenirs from the shop and a certificate to prove he had driven a full size JCB all on his own, which he is very proud to show off. It was a lovely day which we all enjoyed, especially Darin. Darin finished the radiation in the middle of August. It felt very strange for while suddenly not having to be at the hospital every day, but we got over that quickly and began enjoying what was left of the summer holiday. Last week we were invited to RAF Lyneham with a few other Clic Sargent families, the first thing we got to see was a Hercules plane. It was something that Darin had never seen before (the last time we were that close to a plane was about 3 years ago when we flew easy jet to Glasgow to stay at a Clic Sargent home called Malcolm Sargent House so he would not remember that). Darin was really scared but I managed to coax him in to the cockpit where he got to sit in the pilots chair and play with the controls which he did quite enjoy, but was still a little on edge. We had a very nice lunch and then got to see a bit more. They had a demonstration of some of the equipment they use, their guns, tents etc and then we got to see one of their fire engines, Darin loved that, he even got to drive it round the block. We all then got a ride in a herc simulator, which Darin quite enjoyed also. We have also heard from make a wish. There had been some delays about granting his wish to be a postman, mostly due to all the strike action recently, but we heard on friday that the post office would love to help, so now it is being decided what they can do and how. Darin may even get his own uniform (if they make them small enough) and the possibility that it may be filmed as well, which would be a lovely keepsake. Hopefully it will be granted soon before it gets too cold. Darin is really well at the moment, apart from catching a couple of bugs and getting a bit of sickness and diarrhoea (on wednesday he was sick twice and the second time his NG tube came out as well). I managed to get the doctors to agree that it did not need to be passed back down, so we are now NG free!! Without the tube Darin no longer looks ill which is nice. Thank you again to post pals and every one that posted to Darin and Emily (thanks Kate D, she loved the pen and takes it to school with her). Thank you to Sameer, our pal Nicole D, Sophie P, Kate D again for your cards letters and pressies. Hope I didn’t miss any one, I think I kept up with what was being opened! A huge thanks to Karen Moore for all your support and gifts, Darin really enjoyed getting your letters and playing with your gifts. To every one that has emailed Darin in the past, there was a mix up with our email address, so I did not receive any for quite a while. I just got about 17 of them all in one go! Here’s a belated thanks for all your thoughts and kind words. Darin is doing so well now, better than anyone ever expected. We are now half way through the radiation and every body can see such an improvement in him, he is only taking the odd nap here and there. On a bad note though, the debulking has made Darin’s sight deteriorate again. I have had to contact a residential school for the blind so that he could be assessed as even his school are not sure what is best for him. He can no longer see the large print he was able to read, but we think he has a little too much sight to go back to braille. We will be going there in November for the two day assessment. 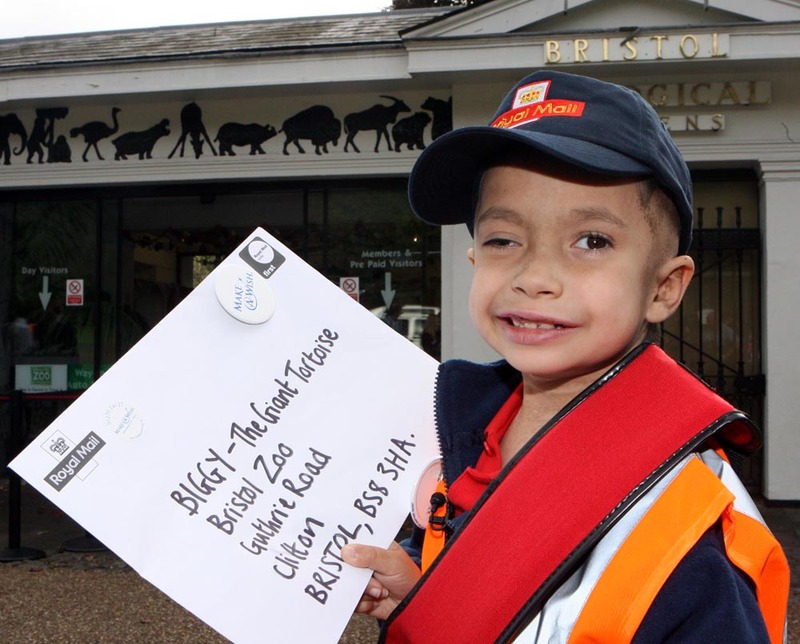 This month we are looking forward to ‘make a wish’ granting Darin’s wish to be a postman. He is really looking forward to it. Thank you to Despina, Sophie P, Susanna Wilde, Cathe Garnett, Theresa, Fam Lappey, Pippa, Ellyn and everyone at postpals (he loved the balloon by the way) for the postcards, cards and gifts. Also a very special thanks to Karen Moore (Darin is really enjoying everything you have sent and getting to know you all) and to our well wisher for all the gifts you sent, Darin loves the tin of crayons and the colouring books, he also really enjoyed seeing the beast grow in his cage. As usual I hope I haven’t missed anyone, if I have, thank you. The past week has seen Darin really start to recover. He managed 2 full days at school last week, something he has not managed to do for a very long time. I’m hoping he will manage even more this week. Unfortunately he starts radiation on the 9th, and no one can be sure how this will affect him so it might put us back again, but he is really enjoying being around his friends again. Darin has been so brave this last month. He has had to endure some things that he really hates, the mould of the mask that he will have to wear for each treatment being the worst. He had to try and keep still while the tech put plaster of paris on his face and then wait for it to dry (he has a huge aversion to messy things like that!) Darin will have to wear the mask for about 20 minutes, 5 days a week, for 6 weeks. Something else that will be very difficult as he also doesn’t like to be confined. Thank you to everyone that has sent post, visited his website or just thought of him. Thanks also to everyone at postpals for all that you have done. I had a call yesterday from a booking clerk with dates for Darin to get his mask fitted and start his radiation. I’m not really sure how I’m feeling at the moment, I’m pretty upset that the call didn’t come from our oncologist and we didn’t have another meeting with the radiologist first. He will be getting the mask fitted next week, scans the week after and radiation will start the week after that. I had to look after my two nephews last week; they are aged 2 and 3. The two together even at their age were so much easier than Darin, they played on their own and didn’t need me every 2 minutes. The time with them really highlighted how different Darin is and what this tumour has really done to him. I wouldn’t change him for the world, he is a very special little boy, but it really did make me feel like I have missed out on some special times that were replaced by hospital visits and chemo! Not to much to report at the moment, apart from some headaches and still being tired, Darin is doing well. We are waiting on a scan to see if anything is going on! Darin is still on the night feeds. We had some initial teething troubles where Darin managed to pull the tubes apart two nights in a row, getting milk everywhere. I can tell you even a small amount of it seems huge, I had to wash everything even his pillows were dripping with the stuff. I am glad I persevered as Darin has put on weight and looks so much healthier. I will put it down as one of the many things I can look back on and laugh about. Darin is still not back at school, he managed half a day on monday, but has been too tired to go back since. Thank you to everyone that has sent Darin cards and presents during our hospital stay, they really brightened up some very long stressful days! Darin was discharged from the hospital on Tuesday. He has done remarkably well; everyone is so pleased with him. It’s really a testament to how great our neurosurgeons are and what a fighter Darin is. Darin is recovering well, with just a few issues and he will be back in theatre on Tuesday. Darin had his operation on Tuesday (sorry my fault for the wrong day) and it was a very lengthy one lasting 10 hours. He is recovering well though – so well that the neurosurgeons are considering operating again on Friday or Monday to try and get some more tumour out, as they didn’t get much from the brainstem. Darin had another episode on Monday. He was falling over and was very shaky. He was scanned on admittance in case it was a shunt malfunction. Unfortunately it showed the tumour is still growing even with the chemo. It has really started to press on the brainstem, causing him to become very sleepy and clumsy. It is being decided if de-bulking the tumour will help or if we should just do radiation. I am devastated. You always know this day might come, but hope it never does as there are so many risks. He has already been pencilled in for the operation on Monday, if all the doctors involved agree it is the best thing to do. Darin has a scan tomorrow and will be starting chemo on Monday. It’s a new one for us so I’m quite anxious as to how it will make him feel. Darin will be restarting chemo in the next couple of weeks as he is still having so many problems with his cyst and our oncologist doesn’t want things to start getting out of control. Darin will be on this latest chemo for 18 months, but if after six months things are not at least stable, then we will have to switch to another chemo. We are just waiting one final time on the neuro surgeons to see if they will put another drain into the cyst to give Darin some freedom from his headaches. Darin is as always being such a brave fighter but I wonder what all of this is really doing to him. On a good note Darin is starting Beavers. I thought it would be hard to get him in, but the group I found had a couple of spaces and its quite small with only 13 other kids. The leader is one of the BMT nurses at our hospital and known to Jack Bradley B’s mum, so that has really put my mind at rest about leaving him without the 1 to 1 he is used to. Darin has continued to have his cyst drained this month; unfortunately it no longer seems to be successful as Darin has started to get headaches again. Darin has had a good month this month; however he has become anaemic and is still going in to hospital weekly to drain the cyst. Thank you to everyone that sent Darin a card for Christmas, I would like to say thank you to all, but we got so many and I don’t want this update to go on for too long! Thank you to Julie and Alan Barrett for all the gifts you sent this month. To Paul and Barbara Morgan for the snowman activity book, Karen Reece for all the stickers and chocolate, Susanna Wilde for the fridge magnet, post pals for the stocking kit and Charlie for your gift, the cars and Christmas activity book have been played with a lot. Darin is feeling better now that the weekly chemo has been stopped. It puts me on edge though as there is now nothing to stop new tumour growth, this means any signs (like loss of balance) will have me in knots thinking there is new growth. We are still waiting to hear if Darin will need surgery on the cyst, he has had it drained a couple of times now. Thank you to every one that sent Darin cards and presents this month, they really cheer him up. Darin is still not right! I have to wait until monday to talk with the oncologist about what we will do. I missed his call this evening due to a trip to A and E (Darin has developed a lump near his port, the x ray showed nothing was broken so next time the port is accessed they will put some dye through it to check it’s not leaking). A huge thank you to Laura and Chris for the birthday card, to Kate for the card and stickers, Julie and Alan for the card, book and Postman Pat make a scene, Mandi for the card and elephant make and build and Kate Dee for the toy elephant, we all got a kick out of the way the arms and legs grew and shrank (I hope I got everyone and all the right names with their pressies, Darin got to them again before me he was so excited). Darin had an mri scan today, there are some changes and we think Darin will need surgery next week, please read his page to keep up with the latest news. Darin has had a bit of an up and down month. We are waiting for a MRI scan to see if the tumour is stable and a test to see if Darin is developing diabetes insipidus (not the same as diabetes this is to do with thirst). Thank you to Cherie and Itsy, Katie Hammond, Karen, Nicky Walker, Becky and Julie and Alan Barrett, for the cards and gifts you sent. Darin has really enjoyed receiving them. Thank you also to the person that sent Darin the note pad from Israel, sorry I don’t know your name.